The great (and funny) astronomer Phil Plait ran this on his blog, Bad Astronomy. Stare at it for a while. See the spirals? 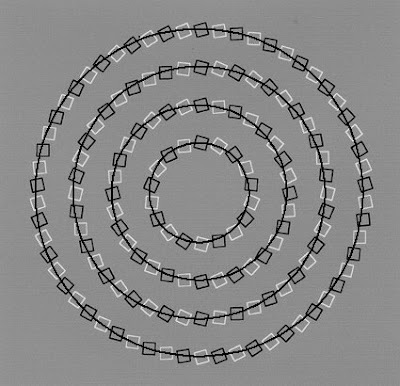 Not so fast, there aren't any spirals. 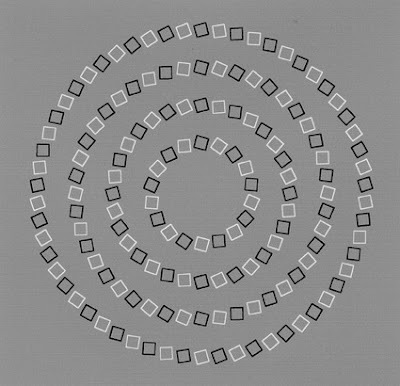 Here are the circles, not spirals, in that first image. It's funny. Even though I know that there aren't any spirals, my brain persists in seeing them none the less. Pretty cool. Phil picked it up from his friend Richard Wiseman. Richard Wiseman is another brilliant blogger. Wiseman's also a psychologist, magician and author. He writes the blog Richard Wiseman Blog. Trust me, it's a good deal more amusing than the title would suggest.